Foraging in the studio yesterday for my black threads had its advantages: I came across some treasures that I had (admittedly) forgotten about. 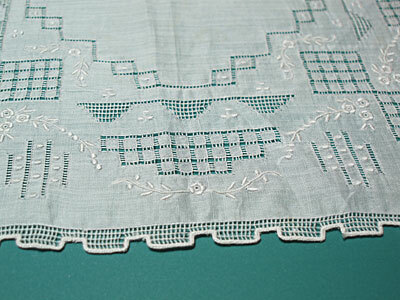 Among them is this very delicately hand embroidered handkerchief that I bought at an antique store ages ago. I thought I’d show you some photos up close. It’ll give you a whole new perspective on drawn thread embroidery and whitework! It’s a very pretty handkerchief, but it is certainly not an “original” design or one-of-a-kind piece. I recently saw one very similar to it (if not identical – I didn’t have this one with me to compare) in another collection of vintage textiles. It caught my eye because of the edges. The edges feature a crenellated pattern, with the threads drawn to form a net, and the edges worked in tiny buttonhole stitches. This form of edging is not uncommon – I have a few pieces of heavier vintage linens (dresser scarves) with the same edge pattern – the work is not as delicate as this, but still very fine. 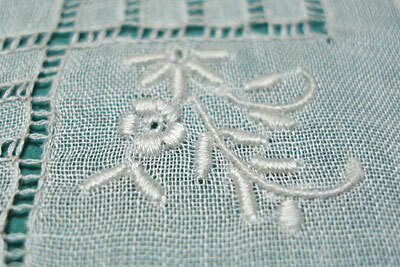 The little whitework flower design sprinkling the hanky is so tiny and delicately done. There’s an itty-bitty eyelet in the middle of each flower. While the leaves may look almost like a bullion knot, they aren’t – they’re worked in an overcast stitch – that is, they’re satin stitched over another single thread. You can see the single thread sticking out at the end of some of the leaves there. My favorite part of the design is these three corner squares, surrounded by the little flowers. Each drawn thread grid there is just barely over an inch square – split into nine, with the threads drawn out and hemstitch worked all around. It’s all so fascinatingly small. So, despite the irritation of my desperate search for my black threads yesterday (more on that later – there is an ironic ending to that episode! ), I was really thrilled to be reminded of a few pieces of embroidery that I almost forgot! In addition to a few vintage pieces of needlework, I unearthed a large collection of kits, charts, designs and stuff that I will never ever in a million years use. They’ll make excellent give-away treats. They’re mostly for counted work – they came in a bundle package that I bought when a needlework store closed. They’re all “new” (unopened, unused), but not all necessarily “recent.” There are some series pieces in there – Old Santas and the like – as well as some Primitive designs (in surface embroidery), some historical flavored pieces (Quaker and old English), and so forth. So I’ll be giving those away in bundles – keep an eye out! And, finally, I did set up the blackwork project, so I’ll show that to you this week, too. It’s not what you expect, so please don’t expect much! And, yes, I’ve managed to put some stitches onto a couple projects. With all that, here’s hopin’ I can keep things interesting this week! A giveaway with drawn thread theme??? so many to learn about drawn thread! Oh, Mary, your latest blog is about a particular weakness of mine. I adore collecting handkerchiefs and have amassed quite a few of them. It's amazing how tiny and precise the stitches are. I just love them! Don't you just love it when you find something you have totally forgotten about in your stash. Good for you. I just love your site and look forward to reading it every day. 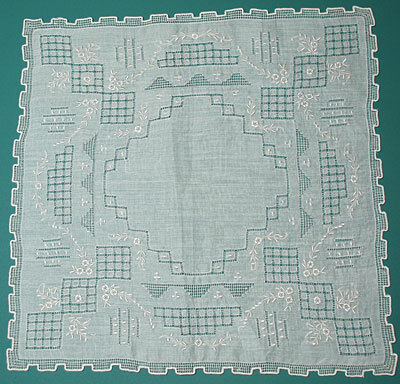 I'm currently working on a handkerchief for my grandmother, but it's not nearly as elaborate as this one. Just hemstitched edges with a crochet lace border and her monogram — but I know she'll love it and use it. At 96, she's from the era that actually used such beautiful pieces of handwork. Ones for showing (like yours) were often made (or bought) for weddings, then used to wrap tie up sachets and kept in the drawer to make other delicates smell sweet. The one I'm making, being simpler, will be "for blowing," or for wiping one's brow on a hot day, or any of the multitude of reasons I reach for the tissue box, then throw the tissue in a landfill somewhere. I think there's something beautiful about the way Grandma cherishes such small comforts, and the way something so simple can be made to be as beautiful as your hanky. It's really a work of art! My heart is kind of heavy this morninig. We're going home for a while and I will miss my 10 mth grand daughter terribly. So…. I was really pleased for the post on this handkerchief. What daintiness and love put into it wouldn't cheer the heart. It sure is a treasure. Love the hankie, I think I would never use it except to dab a tear away, just to draw attention to the beautiful embroidery, grin. 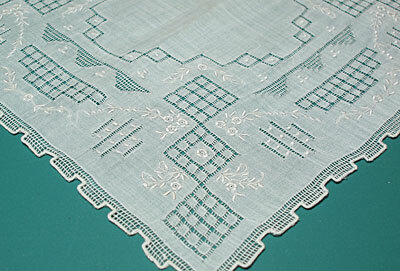 I have always considered embroidered hankies to be wonderful samplers of fancy work. And they are usually so affordable (sometimes "too" affordable!) I have my little collection I love to go through. In fact, when I get really stressed out and everything seems to be in total chaos, it is time to wash and iron a few beautiful, hand embroidered hankies. It is so satisfying and calming! And amid the chaos here lies a clean, pressed, and folded hankie….. ahhhhhh! You blog is going to start being dangerous to me, you keep mentioning all the lovely things I want to do like make a beautiful etui, and drawn thread embroidery and I just get inspired and want to start a new project and I have soo many already on the go! I think you must have found the lost threads and have to admit I've enjoyed reading about all your discoveries along the way! I love your blog and your work. Thanks so much for sharing it with us. Previous Previous post: Two Down, Two to Go, and Where’s My Black Thread? ?